Just a month before the war ended, the R.M.S. Leinster, a city of Dublin Steam Packet Company ship, was torpedoed having just left Dun Laoghaire. 501 of the 771 people on board died, including crew, postal workers, civilians, Voluntary Aid Nurses and eight Royal Dublin Fusiliers. Many were Irish men and women returning from leave. In utterly tragic circumstances, Colin Campbell was travelling with his wife Eileen, and their four and a half year old daughter, also named Eileen. All three were lost in the sinking. Eileen Campbell’s body was recovered from the sea with her baby still tightly clutched in her arms. George Richard Colin Campbell was the son of the Rev. Edward Fitzhardings and Lydia Campbell. Edward Campbell was rector of Ballyeglish between 1879 and 1886. Colin Campbell was born in Ballyeglish, Moneymore, about 1884. The warrant for RBP No. 511 was issued to the then Rector of Killyman Parish Church, Rev. Edward F. Campbell, on 6th June 1890. Sir Knight Rev. Campbell, the first WM of No. 511, was also instrumental in founding the Lord Enniskillen Orphan Fund, a fund which to this day does much valuable work towards the welfare of widows and orphans of members of this institution. Colin Campbell was educated at the Royal School Dungannon in 1998-99. He was one of four sons who did so. Colin Campbell joined the Royal Navy as a cadet in 1902. This began a career with the Navy and his swift rise through the ranks. George Colin Campbell married Eileen Hester Knox Browne, of Fivemiletown, on 22nd March 1911 in the district of Dungannon. The 1911 census lists his parents as living at house 1 in Drumeenagh, Drumaspil, County Tyrone. His father was the rector of St Andrew’s Parish, Killyman, Dungannon. By 1916 Colin had achieved the rank of Lieutenant Commander. He joined the Admiralty Compass Department, rising to become Superintendent of the Magnetic Compass Branch. In 1917, he co-authored a book with Henry Theodore Augustus Bosanquet entitled 'Navigation, Magnetism, and Deviation of the Compass'. This was a manual intended for use by aerial navigators. With Dr G T Bennett, he invented the Campbell-Bennett Aperiodic Compass. The London Gazette announces that his Majesty the King has been graciously pleased to confer the following decorations for distinguished service in the field (D.S.O.) - Rev Edward Fitzhardinge Campbell, B.A., Chaplain to the Forces, eldest son of Rev E F Campbell, M.A., Killyman Rectory, Moy, County Tyrone. Two of the three soldier sons of Rev Edward F Campbell, M.A., of Killyman Rectory, County Tyrone, figure in the King’s Birthday Honours. Major (Temporary Lieutenant Colonel) R M Campbell, A.S.C., the second son, is awarded the brevet of lieutenant colonel for distinguished service in connection with military operations in Italy. He was also mentioned in despatches by General Sir Herbert Plumer (London Gazette, 30th May 1918). Brevet Major (Acting Lieutenant Colonel) G A Campbell, A.S.C., the third son, is awarded the Distinguished Service Order for distinguished service in connection with military operations in Egypt. The eldest son, Rev E F Campbell, Deputy Assistant Chaplain General, was awarded the D.S.O. in the New Year Honours, and was mentioned in despatches by Sir Douglas Haig in December last. Lieutenant Commander C De Burgh, R.N., son-in-law of the Rectory of Killyman, was awarded the D.S.O. in September last. Lieutenant Colonel G A Campbell, A.S.C., Killyman Rectory, Moy, has been specially mentioned in despatches by sir E H H Allenby, G.C.M.G., K.C.B., General Officer commanding-in-chief Egyptian Expeditionary Force. A fifth son of the Rev E F Campbell, M.A, rural dean of Killyman, has offered for war service and has been accepted by the Church Army. He it the Rev T F Campbell, B.A., curate of Dundalk. The Rev E F Campbell has gained the D.S.O. Three brothers, Major Geoffrey A Campbell, A.T.C., Major K Morris Campbell, A.S.C, and Lieutenant G R Campbell, Royal Navy, are all on active service. 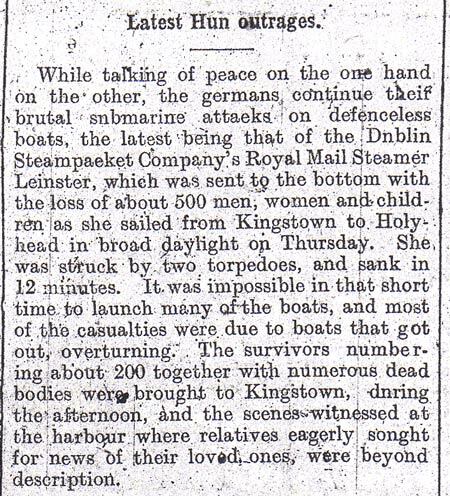 While talking of peace on the one hand on the other, the Germans continue their brutal submarine attacks on defenceless boats, the latest being that of the Dublin Steampacket Company’s Royal Mail Steamer Leinster (RMS Leinster), which was sent to the bottom with the loss of about 500 men, women and children as she sailed from Kingstown to Holyhead in broad daylight on Thursday. She was struck by two torpedoes, and sank in twelve minutes. It was impossible in that short time to launch many of the boats, and most of the casualties were due to boats that got out, overturning. The survivors numbering about 200 together with numerous dead bodies were brought back to Kingstown, during the afternoon, and the scenes witnessed at the harbour where relatives eagerly sought news of their loved ones were beyond description. There were twenty-five members of the Royal Navy on board the R.M.S. Leinster when it was torpedoed and sunk on 10th October 1918. George Richard Colin Campbell was the second highest ranking member of the Royal Navy on the ship. Just a month before the war ended, the R.M.S. 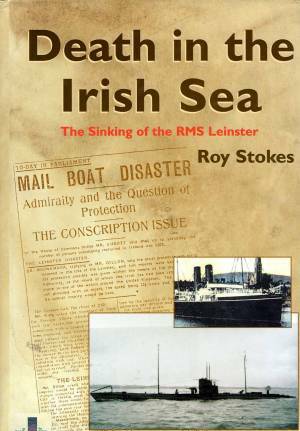 Leinster, a city of Dublin Steam Packet Company ship, was torpedoed by German Submarine UB 123, having just left Kingstown (now Dun Laoghaire). 501 of the 771 people on board died, including crew, postal workers, civilians, Voluntary Aid Nurses and eight Royal Dublin Fusiliers. Many were Irish men and women returning from leave. In utterly tragic circumstances, Colin Campbell was travelling with his wife Eileen, and their four and a half year old daughter, also named Eileen. All three were lost in the sinking. Eileen Campbell’s body was recovered from the sea with her baby still tightly clutched in her arms. They were brought to the mortuary of St Michael’s Hospital, Kingstown, (now Dun Laoghaire), County Dublin where Colin’s father, the Rev Edward Campbell identified them. 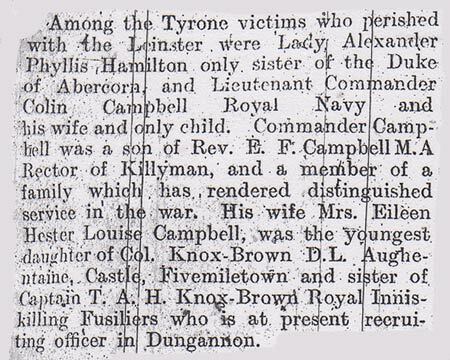 Among the Tyrone victims who perished with the Leinster were Lady Alexander Phyllis Hamilton, only sister of the Duke of Abercorn, and Lieutenant Commander Colin Campbell, Royal Navy, and his wife and only child. 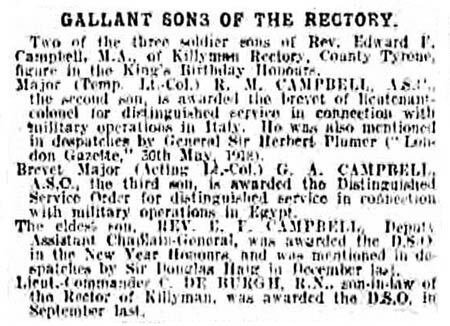 Commander Campbell was a son of Rev E F Campbell, M.A., Rector of Killyman, and a member of a family which has rendered distinguished service in the war. His wife, Mrs Eileen Hester Louisa Campbell, was the youngest daughter of Colonel Knox-Brown, D.L., Augentaine Castle, Fivemiletown and a sister of Captain T A H Knox-Brown, Royal Inniskilling Fusiliers, who is at present recruiting officer in Dungannon. 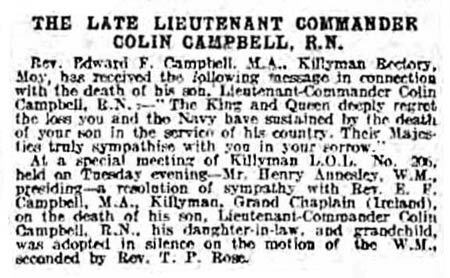 Rev Edward F Campbell, M.A., Killyman Rectory, Moy, has received the following message in connection with the death of his son, Lieutenant Commander Colin Campbell, R.N. :- ‘The King and Queen deeply regret the loss you and the Navy have sustained by the death of your son in the service of his country. Their Majesties truly sympathise with you in your sorrow.’ At a special meeting of Killyman L.O.L. No. 206, held on Tuesday evening (Mr Henry Annesley, W.M., presiding), a resolution of sympathy with Rev E F Campbell, M.A., Killyman Grand Chaplain (Ireland), on the death of his son, Lieutenant Commander Colin Campbell, R.N., his daughter-in-law, and grandchild, was adopted in silence on the motion of the W.M., seconded by Rev T P Rose. Lieutenant Commander George Richard Colin Campbell's body was recovered later. All three are buried in Grangegorman Military Cemetery, Dublin. Their grave has a headstone with a sculpted ships anchor. 1. Lieutenant Commander George Richard Colin Campbell, RN. Compass Dept., (Slough), HMS President. Born Ballyeglish, Moneymore, County Londonderry. Aged 34. Son of Rev Edward and Lydia Campbell, Sheskburn, Ballycastle, County Antrim. The CWGC record Lieutenant Commander George Richard Colin Campbell as follows: Born at Ballyeglish, Moneymore, Co. Derry. Son of the Rev. Edwd. 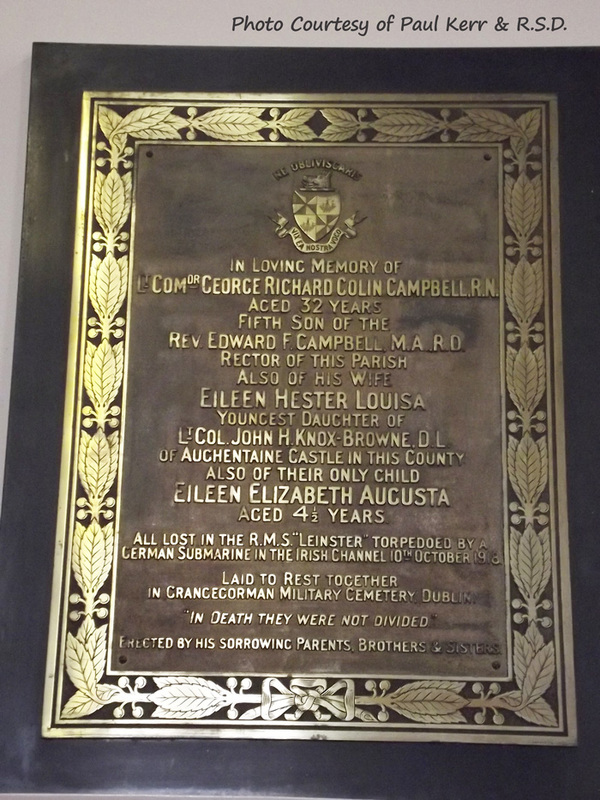 F. and Lydia Campbell, of Sheskburn, Ballycastle, Co. Antrim; husband of the late Eileen Campbell (nee Knox-Browne), of Aughentaine, Fivemiletown, Co. Tyrone. 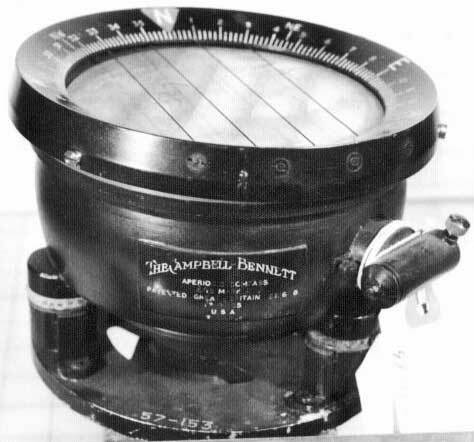 Inventor of Campbell-Bennett aperiodic compass. Many thanks to Paul Kerr and the Royal School Dungannon for his research and all the information provided. 7 Torpedoed! : the R.M.S. 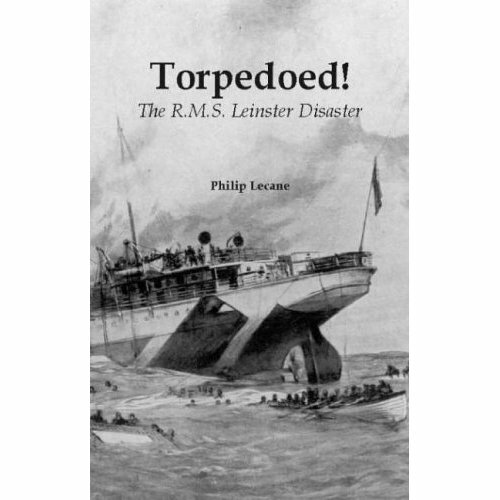 Leinster disaster Book available from Amazon.